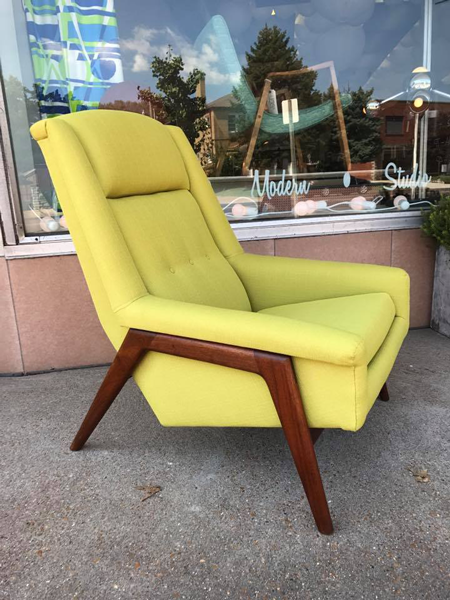 Here in St. Louis where Make it Mid-Century is located, we have a plethora of fabulous mid-century shops from which to choose. 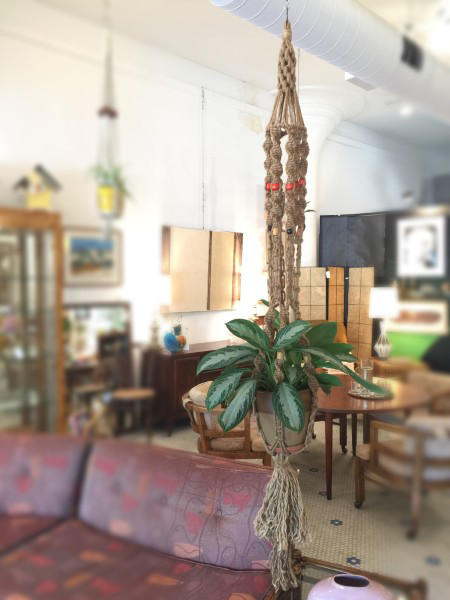 Certainly, there is always Craigslist (you never know what goodies might pop up there) but we also have a wide variety of stores catering to the mid-century aesthetic. These are a few of our favorites. Rocket Century has a wonderful mix of furnishings and smalls all in a gorgeous space with high ceilings and the original hex-tile floor. They also carry a ton of mid-century art from advertising to fine art. Products are changing all the time, but you can keep up with some of the inventory online here. If you aren't from St. Louis or visiting, Kristina still ships her pieces out to customers around the country. Connect with Rocket Century below. Rocket Century is a wonderful shop nestled in the heart of the South Grand business district. Rocket Century has been around in one form or another since 2010 starting with an online-only presence and expanding in 2012 to a physical address and growing ever larger since 2014 with the addition of a collective of dealers that provide the shop with their unique (and fabulous) finds. Kristina Starr is the owner and you'll often find her behind the desk at the shop, ready to talk all things mid-century to whoever happens upon the shop. Her last name could not be more perfect with a shop called Rocket Century! South Jeff MCM is, as the name implies, is located on South Jefferson and straddles the McKinley Heights and Fox Park neighborhoods of St. Louis. The store tends to have a number of more modern mid-century pieces such as 1970's pieces and some Hollywood Regency style items. They are only open on Fridays, Saturdays, and Sundays. Connect with South Jefferson Mid-Century Modern below. 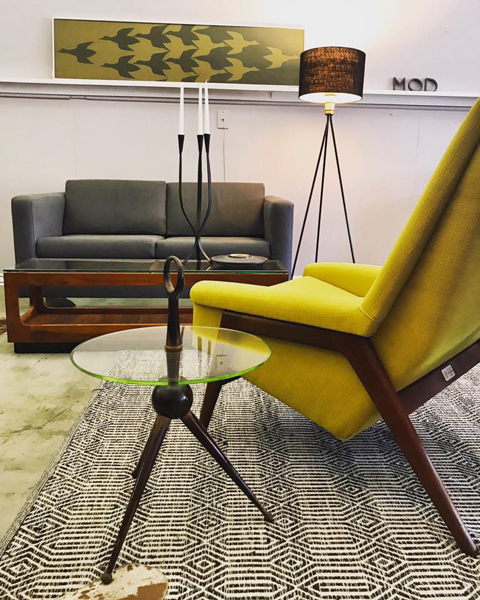 South Jefferson Mid-Century Modern is another great store for mid-century finds. Their space includes a showroom up front with a large, open warehouse space in backfilled to the gills with fun finds. You almost need spelunking gear to make your way through the back. The products here are less curated and ofttimes in need of a little love. Their prices reflect this and quite often all something needs is a quick rub-down with some danish oil or Restore-a-Finish. They even have quite a selection of vintage vinyl here to get your groove on. 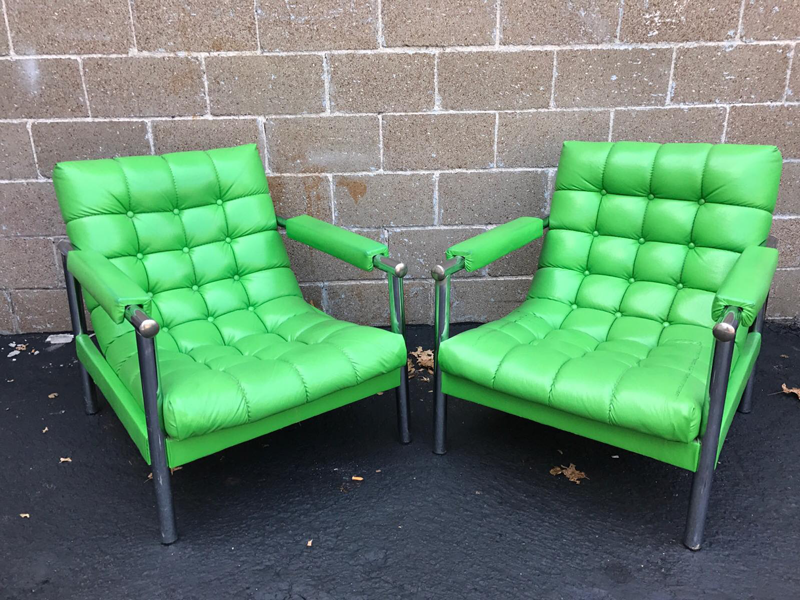 Late mid-century chairs in a fab green. Chances are you'll meet Hannah upon walking in the store and as you're oohing and aahing at the upholstery on these pieces, you'll have Hannah's partner Jeff to thank. He's the upholstery king in the shop and makes even the saddest pieces look like new. Due to the brilliant choice of fabrics, you'd never know that items were re-upholstered. (Can you tell I'm a little jealous of Jeff's skill?) Confluence Modern often posts their products to their website or other social media but do yourself a favor and head on down to the South Hampton neighborhood of St. Louis and pay them a visit. Connect with Confluence Modern below. Confluence Modern is a new kid on the block here in St. Louis, but they've certainly made a splash. Their products (while ever-changing) are impeccable and downright gorgeous to boot. Fohlke Ohlsson style chair reupholstered by Jeff. Don't come to the store thinking that you're going to breeze through the merchandise in thirty minutes or so; the place is so chock full of items that it can start to give you vertigo trying to look at everything. This is a place that you'll want to come back to frequently - not only because the merchandise changes daily, but because of the overwhelming amount of things to see. 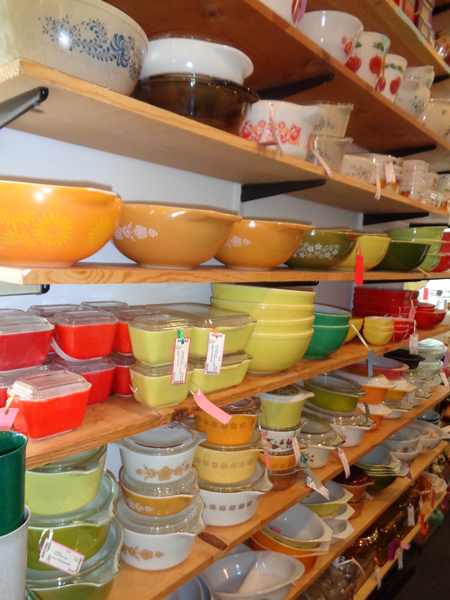 TFA has furniture, kitchenware, barware, Pyrex, vintage board games, lighting (oh, the lighting!) as well as vintage clothing and costume jewelry. If you're looking for it, TFA probably has it and if they don't, I bet they can find it. If Confluence Modern is the new kid on the block, TFA (The Future Antiques) is the grand-daddy of them all. TFA has been around since the mid-1990's; well before the craze we've seen in the 2010's for mid-century goods and furnishings. They've had a few locations, but their current store is perfectly situated on Historic Route 66 just on the edge of the St. Louis Hills neighborhood. One of the best parts of the store has to be the people who work here. They are the nicest, friendliest people around. Located on an industrial section of Manchester Road in the Cheltenham neighborhood, there's always good stuff at The Green Shag Market. Connect with The Green Shag Market below. 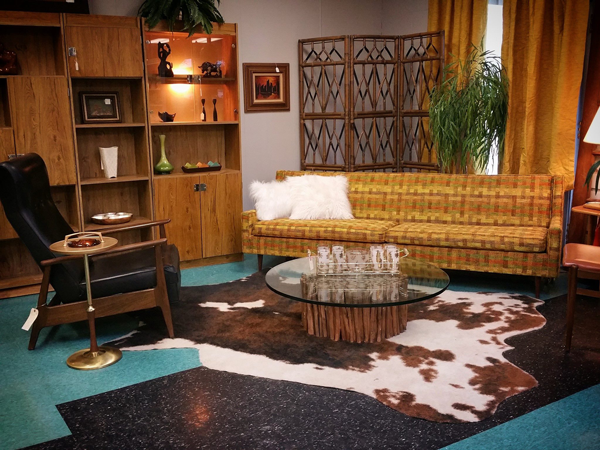 Of course, the best place to buy products and materials for your mid-century home renovation is right here at Make it Mid-Century. We don't have a brick-and-mortar storefront, but that means that you can shop with us even in your pajamas. We'll be adding new products soon, so be on the lookout. Do you have any mid-century stores that you absolutely love in your neck-of-the-woods? If so, we want to hear about them and perhaps even highlight them in a future post. Are you a mid-century store that we haven't included on the list? We'd love to hear from you, too and see what kind of collaborations we might be able to build. Don't forget to follow us on social media where we post new things daily for you to enjoy, and join our mailing list so you'll never miss out on new products, sales, and our monthly update about all things Make it Mid-Century.